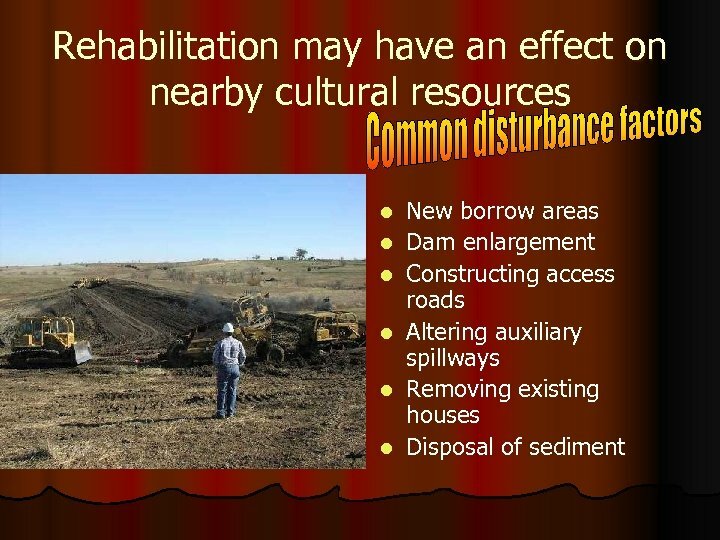 Rehab and NRCS l NRCS has responded to the national need to rehabilitate dams to ensure public safety and extend the useful life of valuable public works. 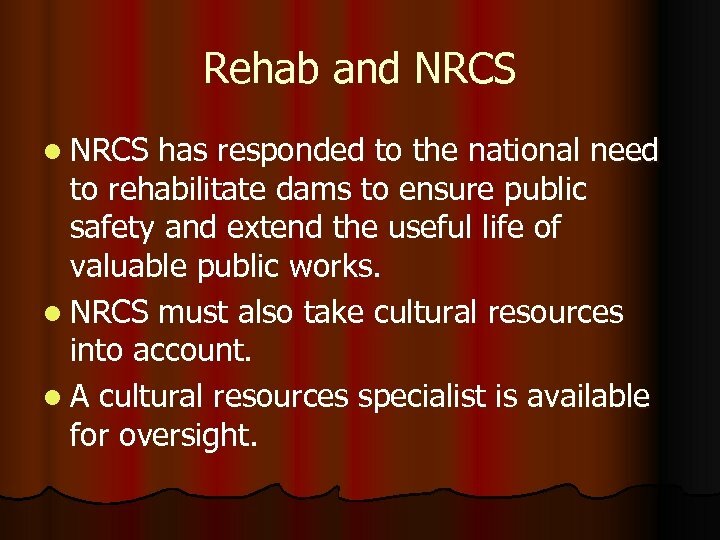 l NRCS must also take cultural resources into account. 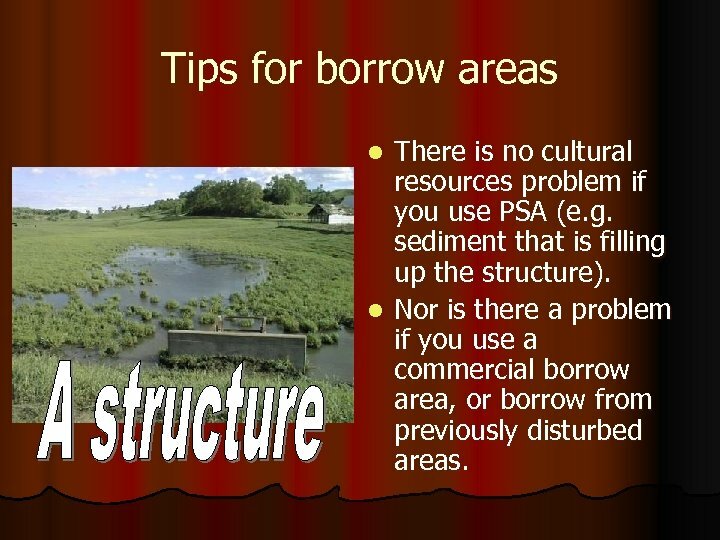 l A cultural resources specialist is available for oversight. 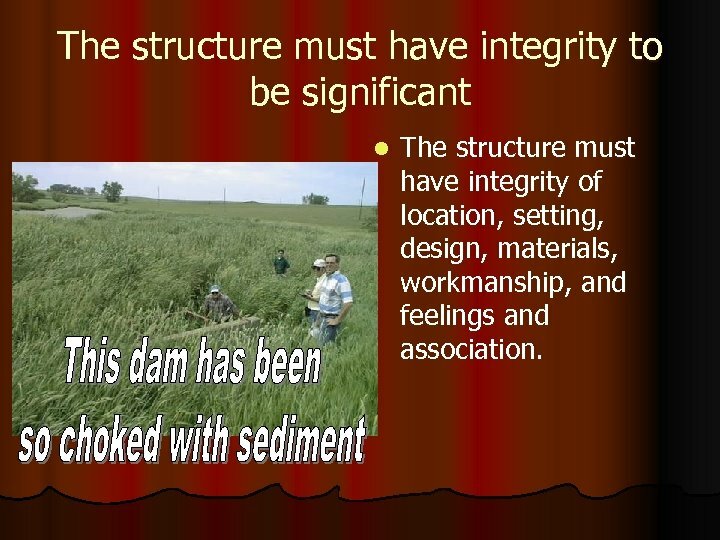 The structure must have integrity to be significant l The structure must have integrity of location, setting, design, materials, workmanship, and feelings and association. 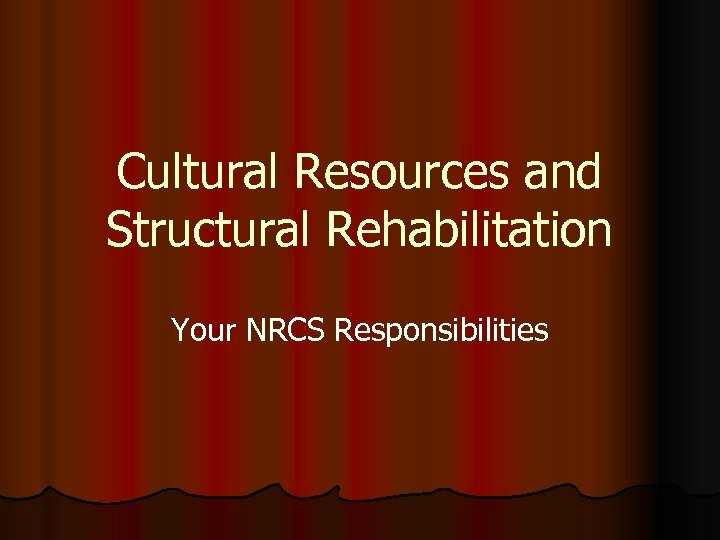 If the structure to be rehabilitated is a significant cultural resource: l And you do not have an effect on those attributes that make it significant, you do not have a cultural resource problem. 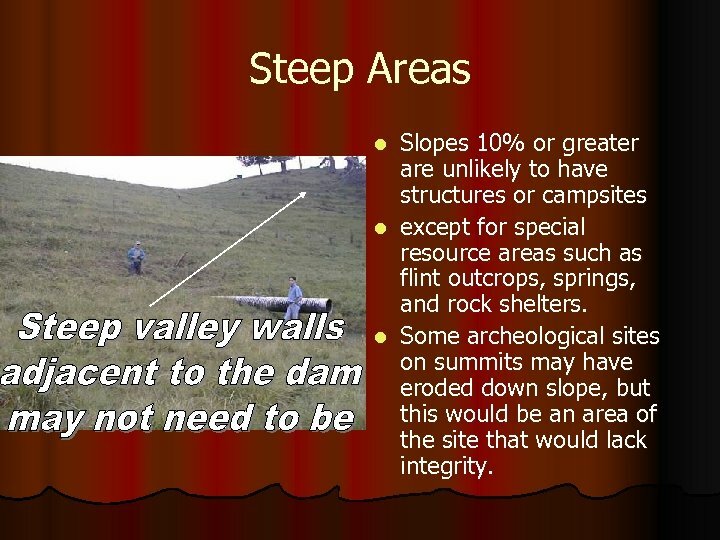 l If you do have an effect, the agency will have to take it into account. 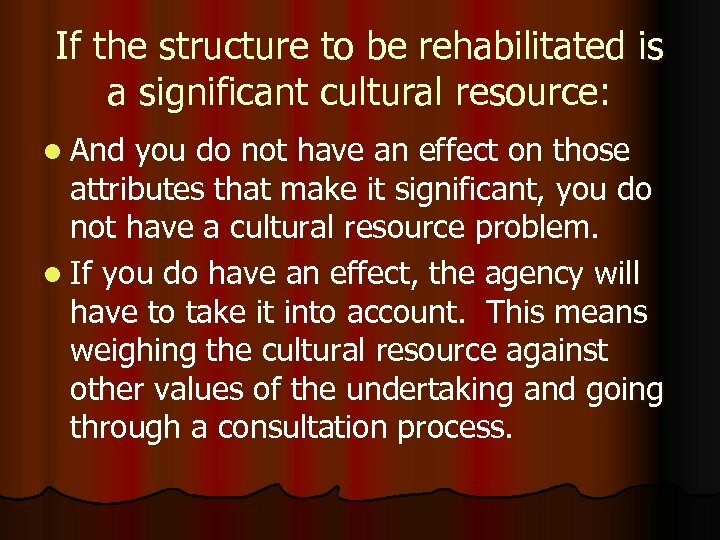 This means weighing the cultural resource against other values of the undertaking and going through a consultation process. 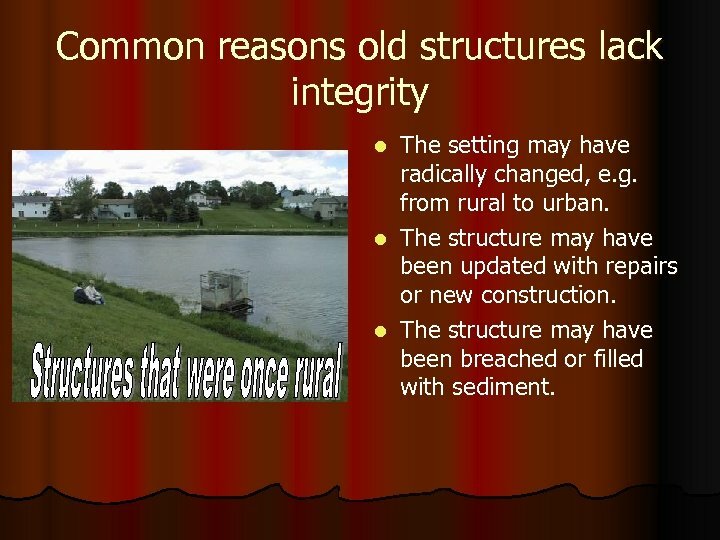 Determine where disturbance occurred during construction l Check old plans. 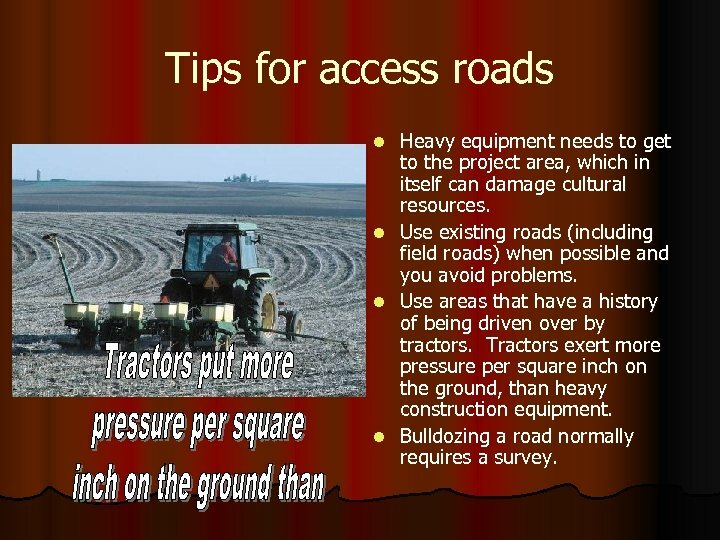 l Ask older members of the community who might know. l Check aerial photos. 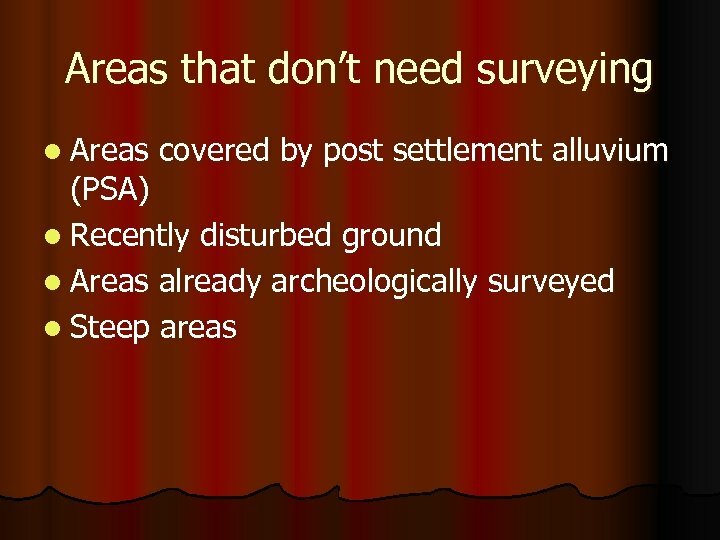 l Get a soil scientist to probe the area. 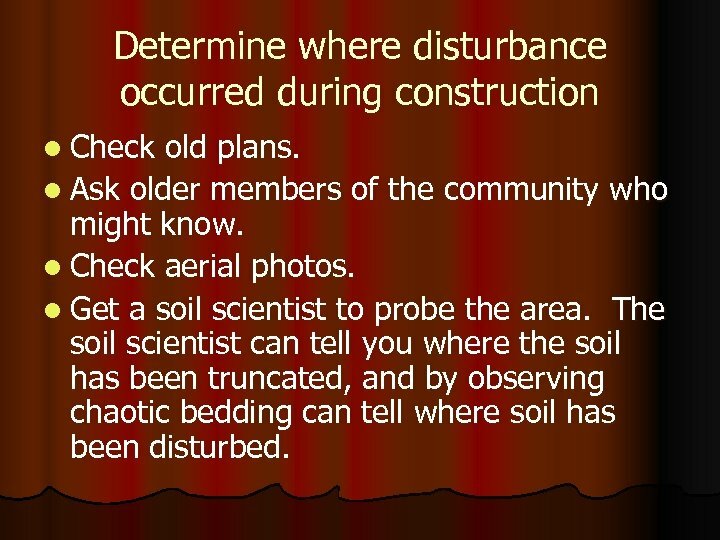 The soil scientist can tell you where the soil has been truncated, and by observing chaotic bedding can tell where soil has been disturbed. 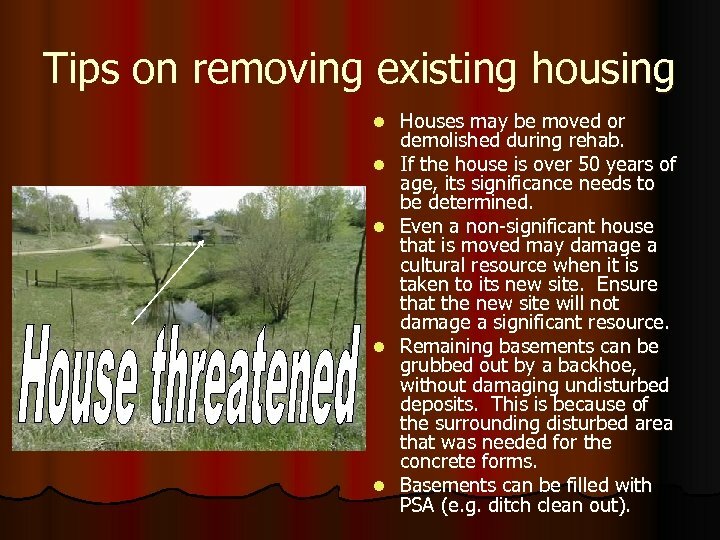 Tips on removing existing housing l l l Houses may be moved or demolished during rehab. 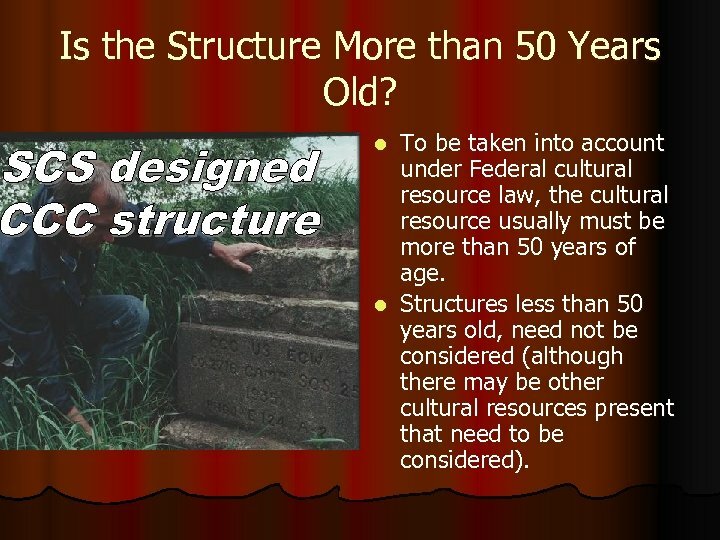 If the house is over 50 years of age, its significance needs to be determined. 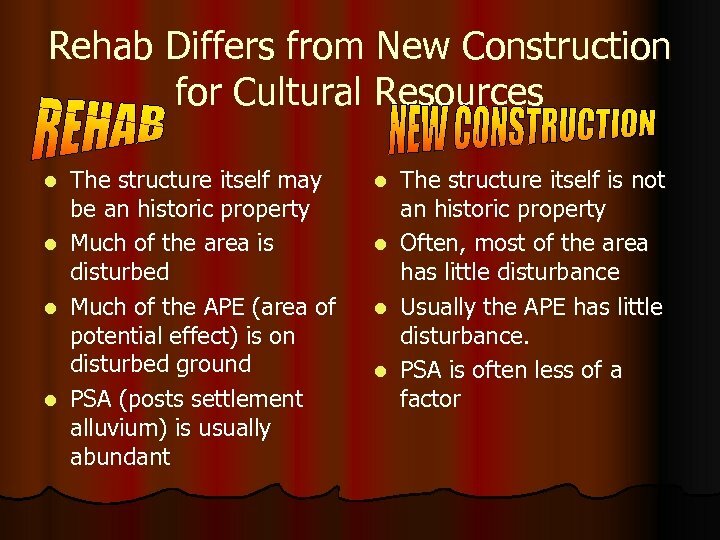 Even a non-significant house that is moved may damage a cultural resource when it is taken to its new site. 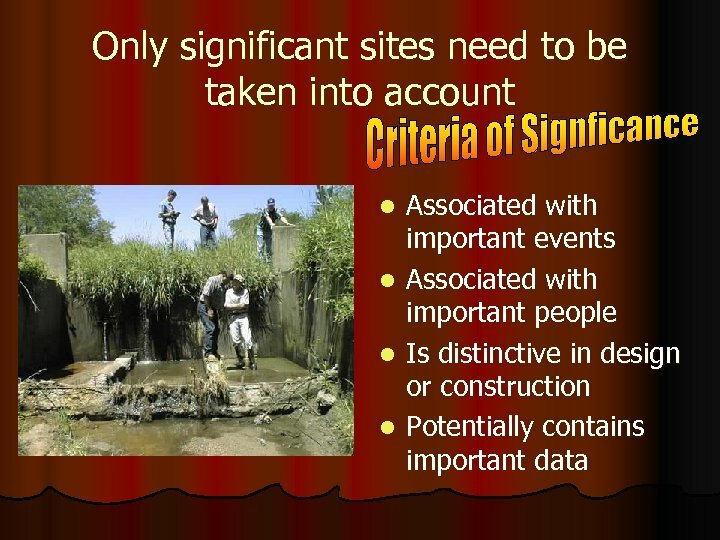 Ensure that the new site will not damage a significant resource. 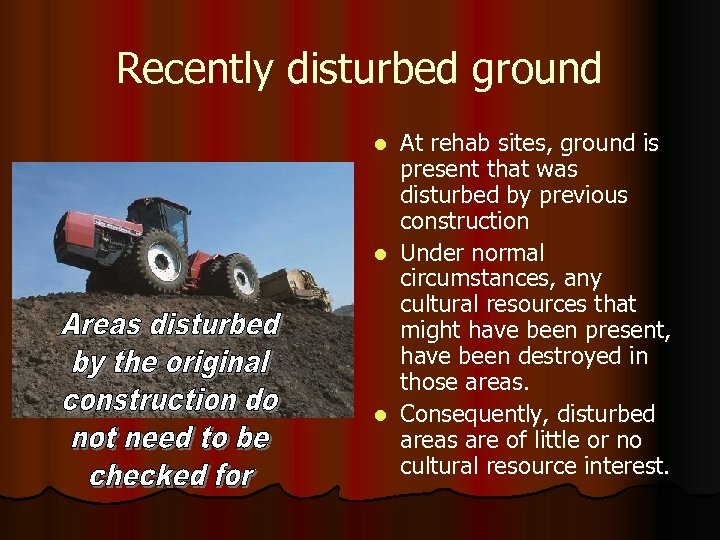 Remaining basements can be grubbed out by a backhoe, without damaging undisturbed deposits. 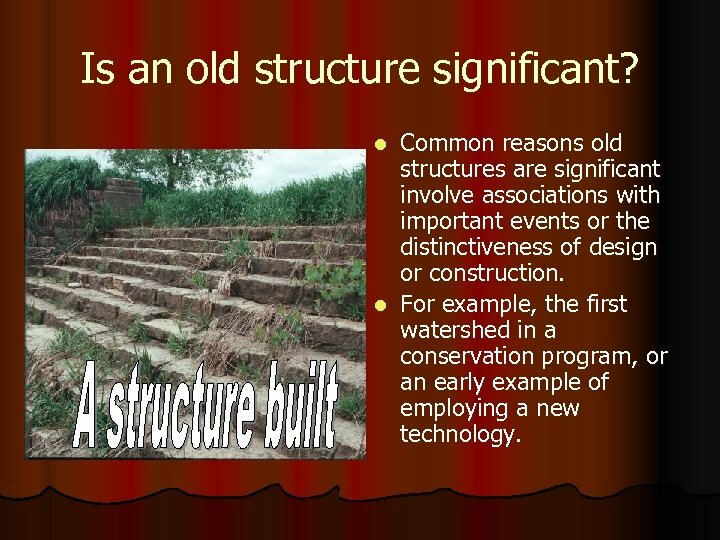 This is because of the surrounding disturbed area that was needed for the concrete forms. 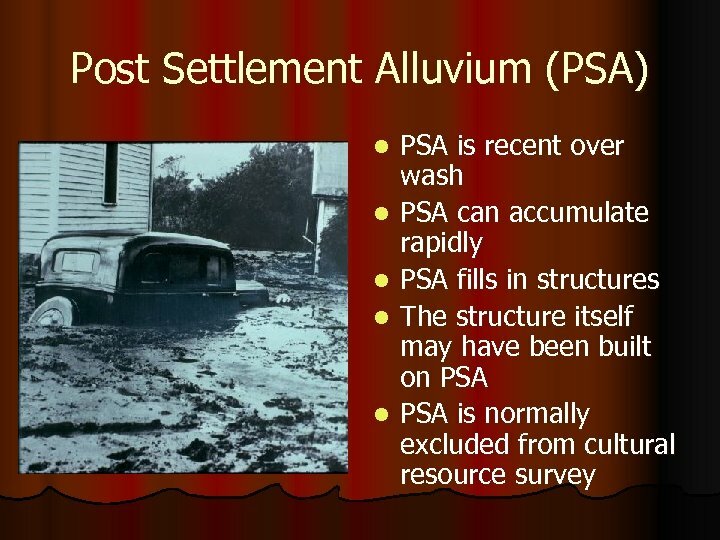 Basements can be filled with PSA (e. g. ditch clean out). 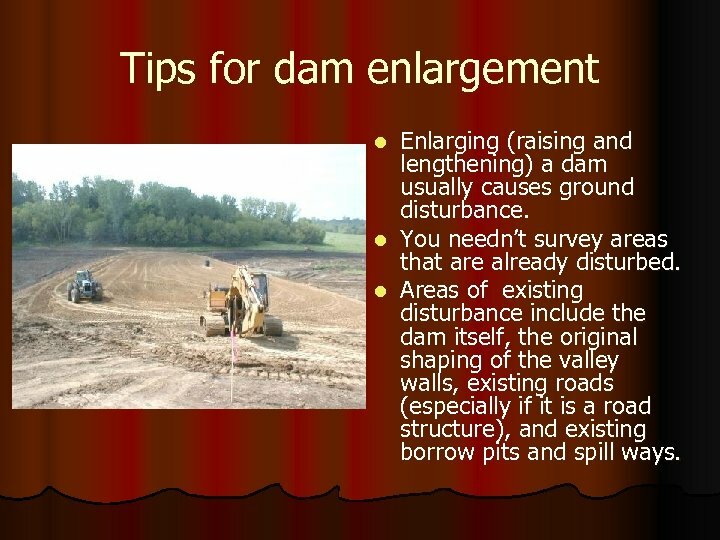 Tips for disposal of sediment l l Dredging or breaching of a dam can produce large amounts of sediment. 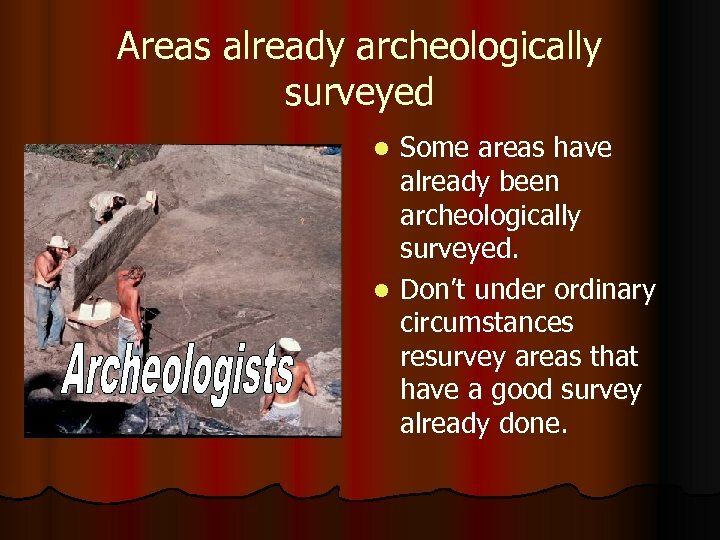 Burying significant cultural resources with its disposal can deny access to researchers. 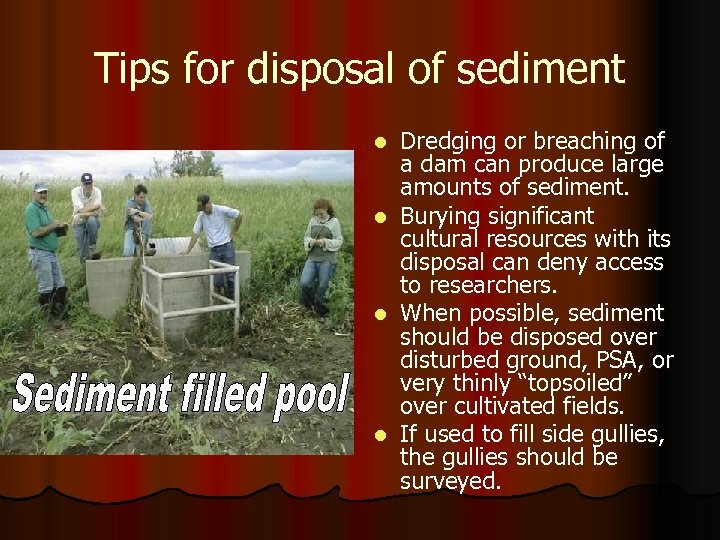 When possible, sediment should be disposed over disturbed ground, PSA, or very thinly “topsoiled” over cultivated fields. 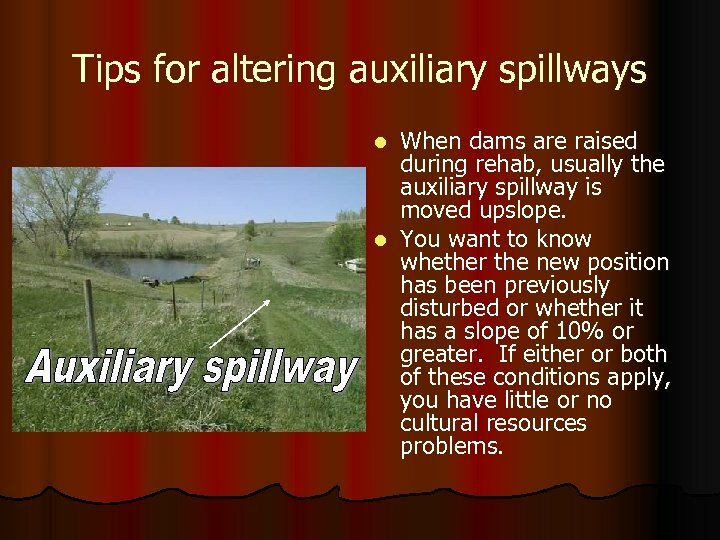 If used to fill side gullies, the gullies should be surveyed.